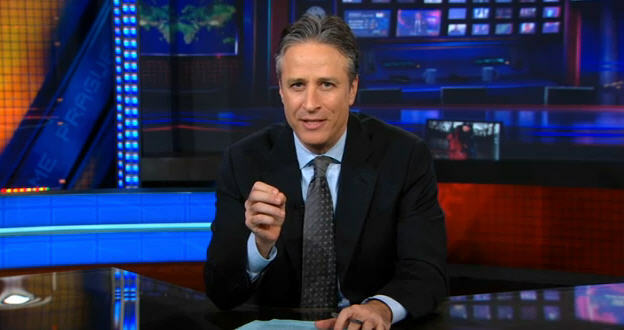 Last night, I dreamed I got invited to Jon Stewart’s Daily Show! I didn’t know exactly why I was invited, whether it was to be in the audience or be a guest, or because I won a contest. I got on a plane, walked through, and for some reason, I was told the show was being taped in Colorado. So that’s where I flew. I got off the plane, went through a tin can like cavern and didn’t know where to find the show. Then I figured since it was in Colorado, maybe it was in a mountain. I started to feel lost, and then there was some writing scrawled on the rocks with an arrow pointing to the Daily Show. I followed it a short way and entered the mountain studio. It was the usual familiar set, and I felt like I knew some of the stars and other people were there from San Diego, including a local actor I know on Facebook, named Butch Dye or was it that famous guy he reminds me of ? Anyway, I woke up after this dream feeling victorious and excited. Maybe Stewart read one of my articles in eastcountymagazine.org about abused kids or other news or my novel, “Naked Skydiving,” and this was finally my chance to be famous or recognized for my work as a writer. It felt great!